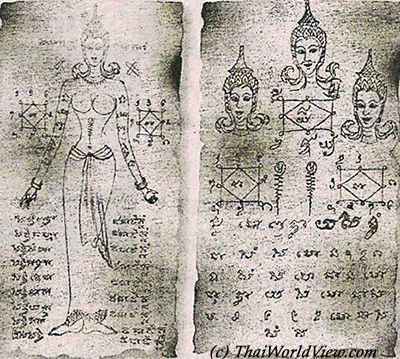 หมอผี or "MO PHI" are the spirits doctors. หมอดู or "MO DOO" are astrologers. 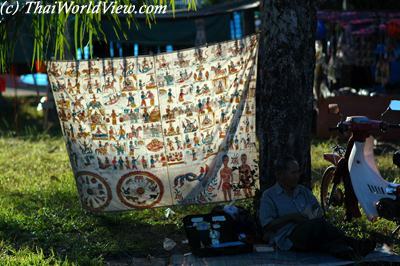 Fortune-tellers and astrologers offer their services around Buddhist temples and on sidewalks throughout the country. Thai astrologers often called them-selves "acharn" (อาจารย์) or teacher. They require day, month, year of birth and a picture to be able to do an accurate prediction. They can help about work office problems with boss, love problems, bad business, money problems, fate ("DUANG CHATA" - ดวงชะตา). At night Thai temples become "evil" places. Monks sleep in their houses. Ghosts and spirits are reputed to wander around cemetary in temples. Some spirit doctors use the oil of buried corpse, called "NAM MAN PRAI" (น้ำมันพราย), to make love filters (ยาเสน่ห์), which are told to be the best. Astrologers are also called "HORACHAN" (โหราจารย์). Many modern astrologers now answer through letter or phone. Still many of them claim to use Khmer style and to come from the south of Isan region nearby Cambodia as it is still seen as remote and mysterious place. Monks have been told not to give hints about lottery results or act as astrologers but some of them are still doing it. A monk or astrologer may suggest that misfortune or suffering can be terminated by taking a new name. Thai administrations can grant Thai people the permission to change their name as often as they want. A monk select carefully the relation between first name and surname to be sure the combination can bring highest luck to their owner. The Ploughing Ceremony, happening every year around May, is of Brahman origin. The auspicious day and hour are still set by the Royal Brahman astrologers. Astrologers can be either men or women. Normally they ask for 300 Baht fee for a consultation about future and fate. In year 2008, Thai astrologers were cashing in on the country's political crisis as people seeked answers to the instability. Bangkok residents use consultation services an average of twice a year, spending an average 200 Baht each time. Well-known astrologers are particularly sought after during the New Year holiday period. The expression ลองของ is used for those doing trials in order to find the right magical recipe. 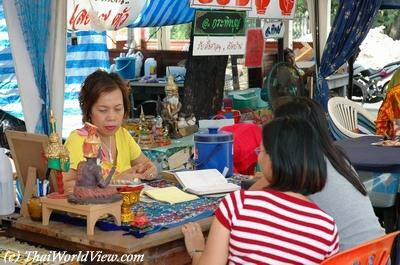 Of course there are dozens of ways of telling fortunes, but in Thailand reading cards or the palm is probably the most popular. The annual biggest concentration of spirit doctors happens each september in Phuket and South of Thailand during the Vegetarian festival. Many men pierce their body with sharp objects or walk on fire. They feel no pain and show the power of the spirit that inhabits their body. This festival is linked to Chinese religion and beliefs. In Thailand many spirit doctors help people to get chance, to gain the heart of a desired mate, to get rid of ghosts, to reveal future, to get rid of curses. These spirit doctors can be ordinary persons who have spirit power ("PALANG CHIT" - ปลั่งจิต) or also monks. But monk hierarchy does not tolerate those monks. In year 2005, a ghostbuster in Maha Sarakham province claims to have caught nine "PHI POP" (ผีปอบ) spirits and drowned them in the Chee river so they would not reborn again. Some villagers who are far from doctors still stick to old beliefs.